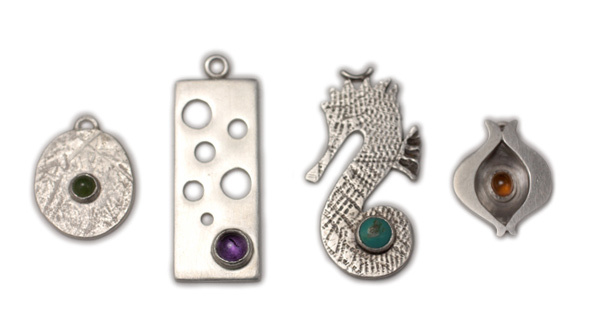 Design and Make a Silver Pendant with a Stone: Weekend Course. – Learn how to design and make a silver pendant with a stone on this weekend course, using traditional stone setting techniques for silver jewellery. On this course we introduce you to core jewellery making techniques for working in silver. We also incorporate stone setting skills to add gemstones to your jewellery designs. We begin the weekend with experiments in texturing metal using hammers, punches and pressing techniques. You will also get a chance to try a range of methods to form metal, to make flat surfaces into gentle curves or sharply angled forms. You will then design a pendant, also incorporating a semi-precious stone of your choice. We’ll show you how to make a setting for the stone and you will complete the piece with a bail or a jump ring to attach it to a piece of leather. Techniques include: texturing of metals; drilling, piercing and filing metal; silver soldering; making a rub-over bezel, setting your stone and polishing. Over the course of 2 days we expect that you’ll produce a range of interesting test pieces that explore texture and form. These tests will lead to a final piece in silver, a charm or pendant with a rub – over stone setting. You may also have time to make your texture samples into simple jewellery items, eg earrings, or additional pendants. The course fee covers the cost of non – precious materials, and you will also be provided with silver to make your pendant. If you wish to put your pendant on a silver chain you will be advised what to buy and where to buy it.